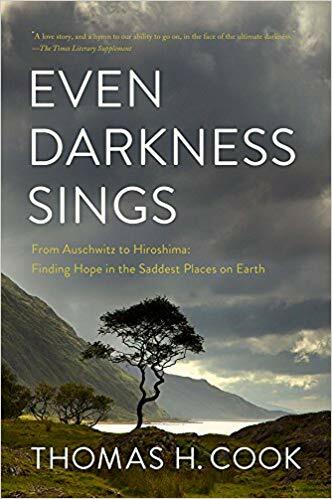 “I have come to thank dark places for the light they bring to life.” The first line of Thomas H. Cook’s memoir Even Darkness Sings identifies the symbiotic relationship between darkness and light that has defined the author’s decades-long journey into the abyss of some of the world’s saddest places, which range from the familiar to the far-flung. With neither a hint of voyeurism nor nostalgia, Cook has used his skills as a seasoned crime fiction writer to create an impressive and moving work of debut nonfiction. Even Darkness Sings flows like a novel, each chapter with unique characters, settings and themes described in rich detail. Historical context is judiciously given for each locale to inform readers without bogging them down in minutiae. As a result, even non-history aficionados can engage with, and appreciate, this book. …in the face of overwhelming loss, perhaps one should be allowed to react to it as one sees fit without garnering the contempt of those inclined to deal with it quite differently. …in remembering them, you remember those you were with in a way that is often richer and more touched by tenderness than memories made in places less charged with emotion or deepened by gravity. …there are limits to how much a dark place can relive and restore you when the place is your own, when you have reached the tragic shore within you, and learned that here, at least for now, there is no light. There is only the necessity to go on. Logan Mortenson is a non-practicing attorney living in St. Paul, MN with his wife and an ever-expanding collection of presidential biographies.